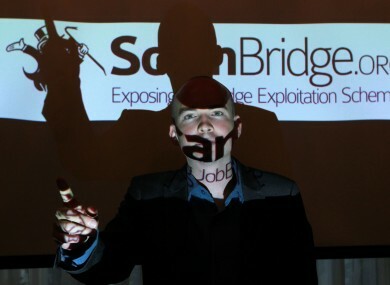 Paul Murphy at the launch of ScamBridge - an anti-JobBridge website launched in 2012. THE “INTERNSHIP CULTURE” created by government-backed schemes such as JobBridge is partly to blame for a ten-year low in graduate wages, the Union of Students in Ireland has said. Yesterday, the Sunday Business Post reported that salaries for graduates in Ireland are the lowest they have been in a decade, with reductions evident across the spectrum. On average, graduate salaries dropped by 11.7 per cent from 2007 to 2014: down from €26,919 to €23,777 annually. The figures were compiled by the Central Bank for their report On the Slide: Salary Scales for New Graduates. USI president Joe O’Connor said the findings “highlight the stark nature of the situation for graduates at the moment”. O’Connor said that “young people graduate with high class degrees and expect to be treated as a full member of work force, but there is an anticipation that they have to go through an internship for relatively low wages”. He said that this “internship culture”, coupled with high levels of youth unemployment following the recession, had created “a very, very employer friendly market”. O’Connor stated that JobBridge is “eroding the pay and conditions of the job market and bringing down wages”. He added that it came as “no surprise” that architecture was the field worst hit, with a 31 per cent reduction in wages: down from €31,500 in 2007 to €21,448 in 2014. O’Connor noted that an area in which there are “huge opportunities now” may offer very few jobs in the future due to the “pace of change globally” in the jobs market. He said the fact that graduates filled 50,000 of out the 58,000 jobs created in the year to September 2013 “highlights that third level education is as important in terms of getting employment as second level was a few years ago”. Higher education is a crucial driver in economic growth. The study found that salaries for Arts graduates dropped by 19 per cent from 2007-2014, down from €24,445 to €19,747 annually. Students in the medical or veterinary fields can expect to earn €29,212, an 11 per cent reduction from 2007. Researchers noted that graduate wages in countries such as Britain and France have also stalled, but not to the same extent as they have in Ireland. Email “USI says 'internship culture' to blame for low graduate wages”. Feedback on “USI says 'internship culture' to blame for low graduate wages”.